We should take note of the two kinds of people in your ministry as you read this. This will help you understand why there always seem to be “conflict in the camp” and casualties from friendly-fire. There is a huge difference between a person who is offering their very soul to the Lord as Moses was and people who followed and only offer their skills or service to the Lord. It’s kind of like the pig and the chicken who wanted to make breakfast for the farmer. The chicken said he would make the eggs and the pig should make the bacon. 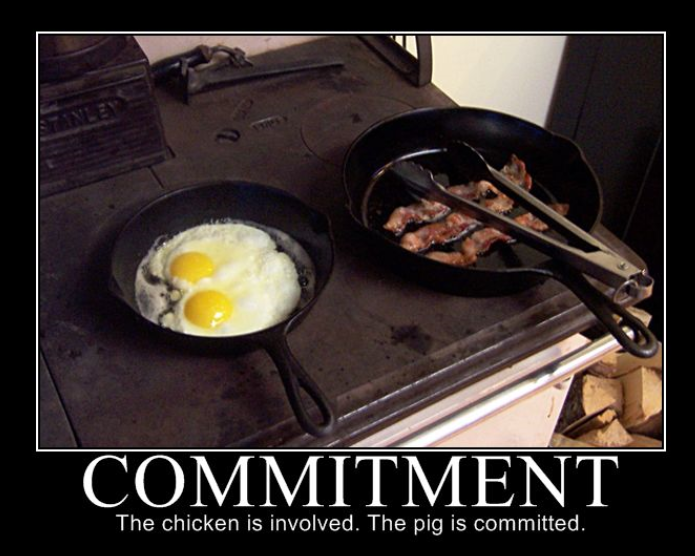 The pig said, “You would be making a contribution; I would be making a total commitment”. Where do you see your commitment level to the things of God? Another important distinction every believer needs to make is the difference between self sacrifice and sacrifice of self. This is what determines if you are going to be like Abel or Cain…somebody whose offering to the Lord is received or rejected. (See Self Sacrifice VS Sacrifice of Self). Posted in Most Popular Articles and tagged All In, Christian Maturity, Discernment, Jeff Krall, Sacrifice, Sacrifice of Self on July 12, 2012 by Jeff Krall.